Below is the link to your page and the picture. That is an awesome idea. Are there plans to build it or more pictures and I will build it from the pictures. I love the idea and design. I'm sorry to say that there aren't any plans. This is a barbecue grill that I bought in France many years ago and it was made by Le Creuset. It's fully portable and collapses down to fit in a plastic case. The unit is hinged so you can flip it through 90 degrees and then the heat is underneath. You can see that better in this page for barbecue turkey. Note how high I can get the grill surface above the coals - this is a riveted adaptation made by a friend of mine. The secret to the longevity of this grill is the quality of the construction materials (cast iron fire box) and I'm guessing that the reason why it's no longer made is the high manufacturing cost and subsequent high selling price compared with a cheap kettle BBQ made in China. 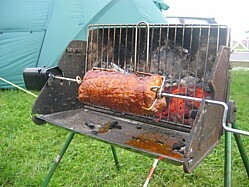 Is it just you and me that use a rotisserie spit? You're not the first person to ask me about this piece of kit and sadly I'm not a barbecue manufacturer. 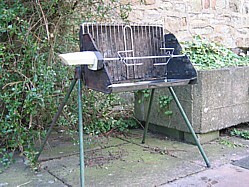 If anyone knows of where I can get a new one of these BBQ grills I'd be really interested to know. Likewise, if anyone out there fancies manufacturing a few, I've got some great ideas how it could be further improved upon! Here are a number of recipes where my Barbecue is put to the test. It looks like you could use a Coleman Outdoor Stove that you would take on picnics or to the camp by the river for cook-outs. If I had the the money and was an inventor with some backing I could make a fortune. It could be done right. Just use the "Contact Us" form to send me your e-mail address and I'll take some pictures over the weekend and send them onto you. Thanks for the photos. Is there any chance you have the full size pics so I can study the design features?